anti-racism episode of Roseanne, entitled "Go Cubs"
I thought the reboot was a tad overrated, but still good. Never liked Roseanne's political leanings, but it's absolutely absurd to me that people could be naive enough to presume the woman is a "racist" due to some dopey Tweet. Regardless of anyone's estimation of her talent as a comedian, she's still a comedian. One who leans toward the edgy and provocative. The same as Patrice O'Neal did, or Jim Jeffries, Richard Pryor, Dice, Chris Rock, Dave Chappell, Collin Quinn, or tons of others who many of us hold on a pedestal, realizing that even their racial and sexist jokes that bomb are still born out of an attempt to be funny rather than an actual distaste, hatred, or bigoted feeling toward someone. I mean, do you honestly believe this woman hates or looks down on black people? Is that what you seriously think? Have you even watched her show or heard her speak or watched her on television getting along with other races? 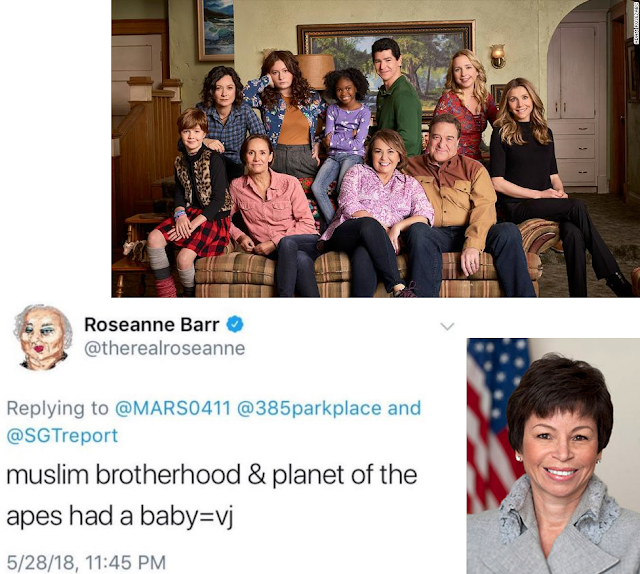 (Incidentally, the 7th episode of the final season of Roseanne, entitled "Go Cubs", was one in which the topic of bigotry against Muslims was tackled). Like I said however, I didn't even see this as hate or racism. And nothing about this woman makes me suspect she's full of hate or is racist. As far as I can tell, she's just another agenda driven rube who's far too into the politics of her chosen political team — sadly, no different than everyone else these days. She's also a comedian who doesn't care to bust balls, who likes to utilize shock, and yada yada (rewatch any Comedy Central Roast and you'll see plenty of other comedians doing the same such things in oftentimes worse degrees). But Roseanne should be fired for doing this on Twitter. In a one sentence comment. A one sentence comment on her personal account on her personal time that she instantly deleted and even bothered apologizing for. Is it different because the joke bombed? Is it different because we can't perceive tone via text like we can on a stage? Is it because she's especially famous from a larger variety of viewers? Is it because of her political leanings and our pre-established assumptions that those on the right are more inclined to be racist? After all, tons of other comedians toss out these kind of jokes (and much worse) all the time on stage, social media, podcasts, and radio. It seems almost random as to who we decide to punish for it and deem as a bad human being. If you want to see real hate and vitriol as opposed to failed attempts at humor, read the comments about this woman online. Read them on this comments section right here. It's more awful and personal than anything we heard this comedian say, regardless of whether or not the people saying the stuff have convinced themselves they're doing so due to a righteous cause or because they're on the side of what's right. You know what they say the road to hell is paved with, right? It would be interesting to see how the rest of humanity would take it if the worst of our impulse-driven, emotionally-fueled, ill-thought out jokes, posts, tweets, drunken yammerings, angry yells, and/or misunderstood comments were to be tossed into the public eye and scrutiny of an entire nation, and our entire life and character was henceforth judged on that isolated snapshot of a moment. Then, of course, we were fired for it and permanently defined by it. But I'm sure the angry mobs and finger pointers know better. They got the numbers and instilled belief that "right" is on their side, eh? Whoever heard of a combo like that not boding well? NOTE: While this whole thing is a definite admonishment of the left, SJW's, and the overly sensitive nature of today's culture, don't take my words as any support whatsoever of the right. They're just as bad. Just within the short time frame that this has happened, they're now calling for the firing of the likes Joy Behar, Bill Maher, and Keith Olbermann due to the double standards they perceive. How does committing another wrong in response to a wrong equal a right? Is vengeance more important than principles? Does anyone even have principles? Didn't someone once say that an eye for an eye only amounts to everyone being blind? Anywho. I'm not a fan of humans today. I guess that's all I'm really getting to. Time for a nap.